Megan Simmons is the director of strategy for Youth Voice and currently a sophomore at Barnard College of Columbia University in New York City, where she is studying political science and sociology. Her involvement in youth organizing began as a junior in high school in Lexington, South Carolina. November 8th, 2016. I was 17 years old. Like all other Americans, I had thoughts, feelings, hopes and fears regarding the election. But because I was 17, there was no institutional way for me to channel those feelings into action. Our voting and political systems believed my opinions and thoughts to be unworthy of impacting the electoral results: I was 9 months shy of the age where my opinions would become validated and I felt defeated. Throughout the election, with the direction and assistance of my civics and social studies teachers, I volunteered on campaigns, ran voter registration drives, canvassed from house to house talking to voters and helped organize debates between candidates running in my district to compensate for the fact that I could not vote on election day. My teachers prioritized student civic engagement and constantly connected me with organizations and campaigns. With their help, I found a way to make my voice heard and have an impact. Though rewarding, this took extensive time and a 1:1 connection that not every student has the privilege or access to. This experience is not unique to just me. 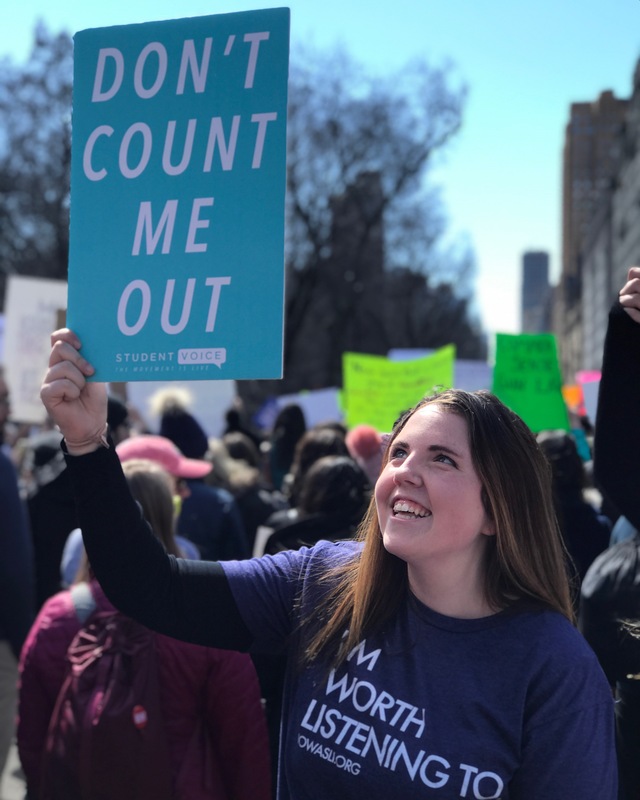 Students across the U.S. feel voiceless, isolated and helpless as it is ingrained in us that our opinions don’t hold enough merit to impact politics or policy until we reach the, arbitrary, age of 18. Even our education system ignores its most important stakeholder: the students. Despite the unique perspective that stems from spending 35 hours a week in the classroom and witnessing things our teachers and administrators do not, decisions are made about us, but without us. Like us all, I had to find a way to channel my post-election feelings into action. Since 2016, I found a space where my voice has influence and purpose as a leader at Student Voice, a national, student-led nonprofit organization dedicated to empowering students to create change in their own communities. On Nov. 17, Student Voice celebrates International Students’ Day, a day where students across the globe come together to recognize the power of their collective voices. As we celebrate International Students’ Day and its commitment to giving students around the world a platform, I remember how it felt to feel helpless, without a path to action, in the most overwhelming of political climates. Back in 2016, I desperately needed a space where my voice mattered and where I could connect with others who experienced this same mystique, yet would not let their age prevent them from leading, innovating and advocating. This is why, today, I am excited to share the launch of a new online space for young changemakers: Youth United for Action (YU4A). YU4A is a Facebook group comprised of students, young people and youth activists that are interested in creating solutions to the problems and challenges persisting in their communities. From free speech in schools to school safety to LGBTQ+ rights and inclusion, YU4A is a place for students to come together because we believe that a connected community, regardless of our identities, interests and perspectives, will advance our individual and collective impact. Our hope is for this to be a space for students to connect with other students, share resources, and learn from and support each other. By joining YU4A, young people will discover countless opportunities for involvement in organizations, social movements, and campaigns focused on solving the problems that they are most passionate about. YU4A is the place for students to become involved in activism, connect with fellow changemakers and create a sense of community to support each other as we work to improve our communities. I was fortunate to have supportive adults in my life, and am calling all teachers, administrators and principals to join us as we work to unite student leaders and activists across the country through YU4A. In just the past year, we’ve seen students rise up, walk out, march, write, and demand that their voices be heard, but we’re not done yet. Show your students their voices matter: invite them to join the Youth United For Action community today.